On Sunday, 23 October 2011, the National Capital Band (Bandmaster Dr. Steve Kellner) visited the Northern Virginia Adult Rehabilitation Center (NOVARC) for the center’s Sunday evening Salvation Meeting. The band played a short concert before the meeting, and then led the worship service. Members of the band arrived at NOVARC at 4:00 pm, doing setup and a short sound check in the center’s multi-purpose area, as the chapel does not have a stage large enough for a full-size brass band. The dining room is adjacent to this space, and, with a movable wall open, provided a large room for the event. After setting up, the NCB ate a light dinner in the dining room with many of the residents. The pre-meeting concert began at 5:40 pm. The band began the 20-minute concert time with an ebullient march by Noel Jones, This Is the Day. This was followed by a contrasting item, Jesus Loves Me (James Anderson). Principal cornet David Delaney and long-time soprano cornet Noel Morris joined to present an exciting duet, Quicksilver (Peter Graham). Another change of style was used to demonstrate the versatility of the band, with the swing-style Shall We Gather (Leonard Ballantine). The mini-concert concluded with another march, Peter Graham’s The Ambassadors. The Salvation Meeting itself began at 6:00 pm, starting off with the congregational song, “When the Roll Is Called Up Yonder”. This was followed by the first of the band’s feature items, the trombone solo Joshua, played skilfully by principal trombone Kevin Downing. One of the highlights of a meeting at one of the Adult Rehabilitation Centers is often the testimonies of the residents. 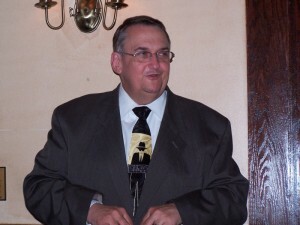 For this meeting, David Delaney energetically led the congregational song, “Stand Up for Jesus”, with several testimonies offered between each verse. The heartfelt statements of men who are in the process of recovery from addiction were, as always, moving and thought-provoking. The band’s second feature item has a direct connection to the venue. Originally written by Stephen Bulla for the dedication of this center, the march NOVARC was a fitting choice on this occasion. Many members of the band also have powerful testimonies, none more so than Band Sergeant Dave Downing. His story is a shining example of God’s healing power, as he was the recipient of a heart transplant nine years ago, and has recently undergone successful surgery for a malignant tumor in a salivary gland. Despite the fact that he can not play a brass instrument at this time, because of the effects of the surgery, he has remained a member of the band, and will be providing multimedia support during some of the band’s performances. The residents of the center showed appreciation as he shared his story during the meeting. In preparation for the evening’s message, Jason and Joel Collier presented the vocal duet He Looked Beyond. Their powerful vocals (so powerful that the sound system in the room was somewhat overloaded) gave a good introduction to the remarks from the NCB’s Executive Officer, Major James Allison. The major’s simple message was effective, with several men coming forward to the makeshift mercy seat in front of the band. The meeting concluded with a triumphant congregational song, “Victory in Jesus”. The band sent the men back to their residence hall with the march Goldcrest (James Anderson). The work of the ARC Command is a vital part of the Salvation Army’s mission, and it was a genuine pleasure for the National Capital Band to join with the residents and staff for this special occasion. The National Capital Band concluded its 2010 – 2011 season in its traditional fashion on Monday, 16 May 2011, with a dinner for the members and guests. 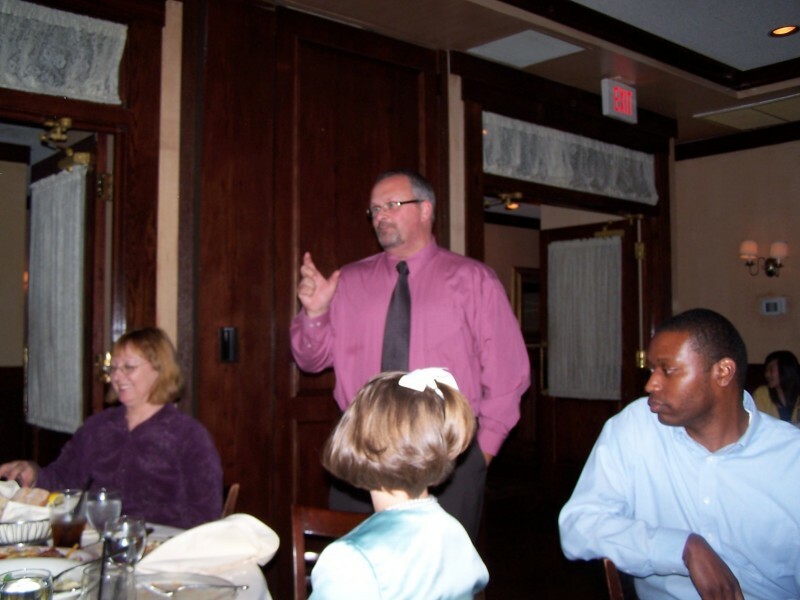 Held again this year at Maggiano’s at Tysons Galleria, the dinner is a time for the leadership of the band to express their appreciation for the dedication and commitment shown by the members throughout the season. Highlights of the event included a retrospective of the past season by Bandmaster Steve Kellner. Beginning with the band’s participation at the annual Family Retreat at the end of last summer, he went through the various engagements and events. 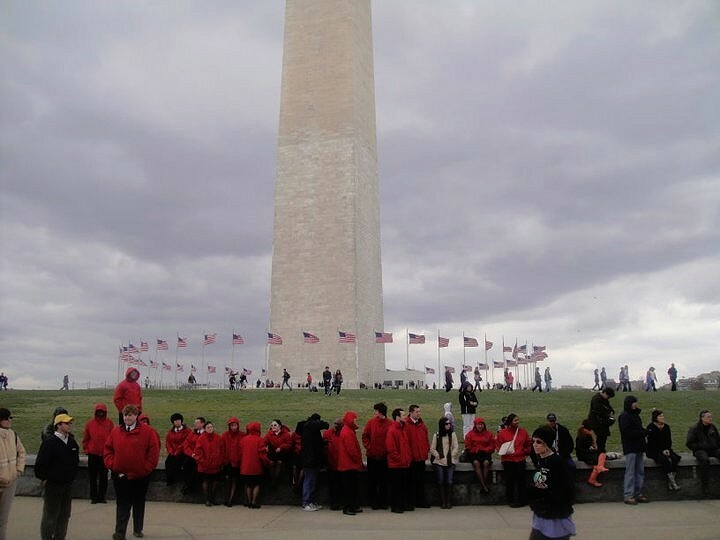 Of particular note were the ministry weekends in Fredericksburg and Raleigh, and the band’s “in-town” ministry weekend in April, which included its first official participation in the National Cherry Blossom Festival. He also outlined some of the things planned for the upcoming 2011 - 2012 season. One of the firm traditions of the National Capital Band is the award at each annual dinner of Bob’s Big Note. 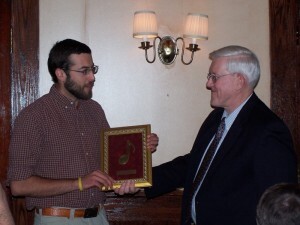 Started by long-time band secretary and principal cornet Bob Goodier at his farewell dinner in 2000, the Note recognizes a member of the band who exhibits musicianship and ministry “behind the scenes” during the season. The previous year’s recipient chooses the next, without any input from the band leadership. For the 2010 – 2011 season, flügelhorn player Paul Deafenbaugh was chosen by David Mersiovsky. 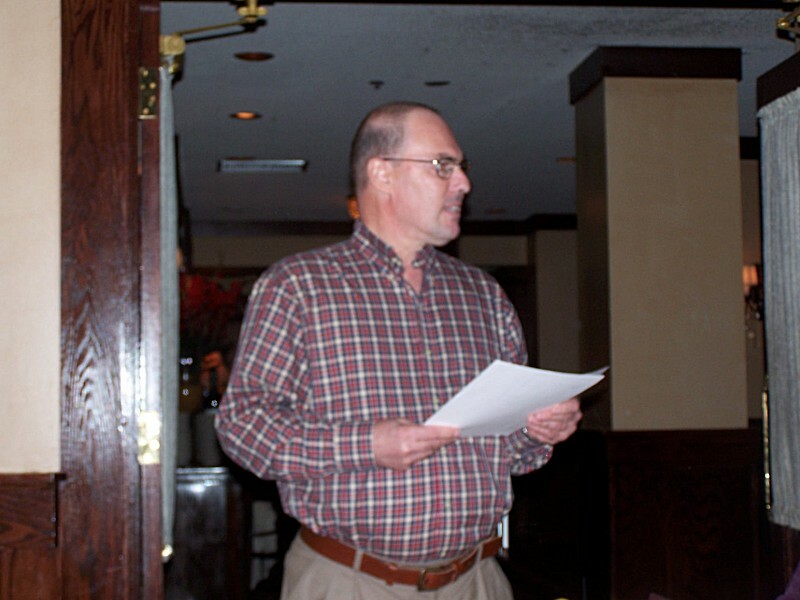 The dinner concluded with brief remarks from the band’s executive officer, Major Jim Allison, who thanked the members and their families for the generous offering of time and talent throughout the year. One of the signature annual events in Washington is the National Cherry Blossom Festival, which stretches over two weeks in early spring. Part of the festival is a continuous series of concerts by various cultural, musical, dance and other groups at the Sylvan Theater, located on the National Mall just south of the Washington Monument. 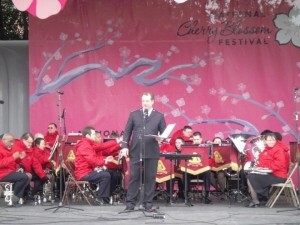 For the first time in its history, the National Capital Band (Bandmaster Dr. Steve Kellner) took part in the Festival as an official participant, with a 45-minute concert at the Sylvan Theater on the afternoon of Friday, 1 April 2011. 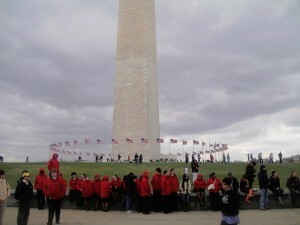 Unfortunately, the weather for the event was not ideal, with cold temperatures, high winds and rain. The rain had stopped by the time that the band began, but the chilly wind made it quite difficult to perform, constantly threatening to blow over the music stands (the Sylvan Theater is a bandstand, covered, but open to the wind on three sides). Despite the challenging conditions, the band played well, presenting a varied program that began with The Risen Saviour (Paul Kellner), based on the familiar hymn “He Lives”. Although not permitted to directly present the Gospel in this setting, Bandmaster Kellner’s selections were designed to pass on the message as an expression of the cultural significance of sacred music through the years combined with a patriotic flavor, appropriate for a concert in that location. The next item on the program was William Himes’ march God and Country. This was followed by the second movement of the suite Shout Salvation (Robert Redhead), which is based on what is perhaps the most-recognized melody throughout the world, “Amazing Grace”. Another Himes march, Motivation, was next, conducted by Deputy Bandmaster Matt Sims. Two classical transcriptions followed, Jesu, Joy of Man’s Desiring (Bach, arr. Leidzén) and Hornpipe from “Water Music” (Handel). The march Novarc (Stephen Bulla), which allowed the bandmaster to mention the work of the Adult Rehabilitation Centers while introducing it, continued the program. The band showed its versatility with the next item, Deep River, a swing arrangement in the style of the famous Count Basie. 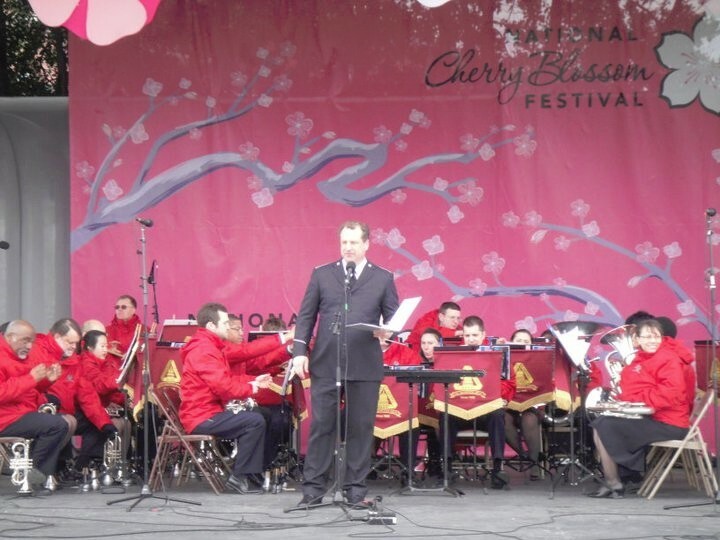 The National Capital Band has always had a strong connection with the military services, having had several current and former military musicians as members throughout the years (including the current bandmaster). Stephen Bulla’s Armed Forces Salute, featuring the service songs of all of the US armed forces, is a perennial item in the repertoire and again drew an enthusiastic reaction on this occasion. To complete the short performance, Bandmaster Kellner chose a march by John Philip Sousa, Power and Glory. While perhaps not Sousa’s most familiar work, the march is remarkable in that it represents one of the very few occurrences where he used an existing melody when composing the march – in this case, the well-loved hymn “Onward, Christian Soldiers”. Because of the timing of the event, several regular members of the band were unable to be present. The band would like to thank Malcolm Stokes, Steve Sutton, Melissa Little and Melinda Ryan for filling in for this performance. A special mention goes to Randy Jennings, who was playing his first brass band concert and first experience with the Salvation Army, sight-reading all of the music in high winds while performing as the sole percussionist. Despite a snowy weekend in the Washington area, the members of the National Capital Band gathered at Gaithersburg Presbyterian Church for the church’s annual Hymn Sing and Chili Dinner. 2010 is the third consecutive year that the band has participated in this event. The event, led by music minister Ann Y. Schmidt, was described as a way to throw off the “winter blues.” The large congregation, accompanied by the NCB and church organist Mark Hanak, sang multiple verses of seventeen hymns and songs. Most of the singing was accompanied by selections from the Salvation Army’s Band Tune Book and the Hallelujah Chorus series. “Big” arrangements were used for God Bless America (Irving Berlin, arr. William Gordon), O Boundless Salvation (William Himes), Onward Christian Soldiers (Gordon Langford) and Crown Him with Many Crowns (Charles Skinner). For many of those present, the highlight of the event was the performance of Andrae Crouch’s contemporary classic My Tribute. Through a fortuitous error, the congregation was not provided with the words of the verse. Bandmaster Anderson, when he learned of this, offered to sing the verse as a solo. As he began the song, with the words, “How can I say thanks for the things You have done for me?” many members of the band (including this writer) found it difficult to see their parts through tears. The bandmaster’s unwavering testimony and passion for ministry through his physical challenges of the past 18 months are a model of Christian faith and have been uplifting, encouraging and challenging to all who have witnessed them. In addition to the accompaniment of the congregational singing, the band presented a prelude, Fanfare and Allegro on the Doxology (Steve Kellner), a feature item during the Hymn Sing, Dance Like David (Andrew Mackereth), and a postlude, Cornerstone (Andrew Mackereth). The band’s Executive Officer, Major James Allison, also gave a short report on the Army’s relief work in Haiti. Following the Hymn Sing, the congregation and the band retired the church’s fellowship hall, where they were treated to a vast assortment of various types of chili, all prepared by members of the church.